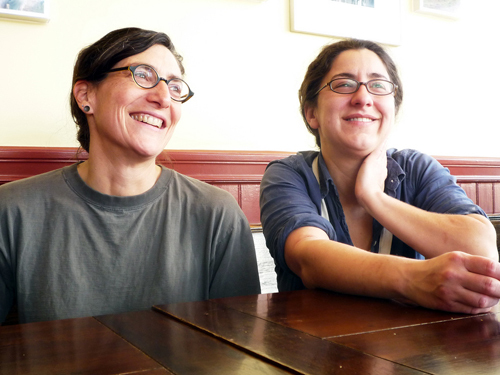 Karen Heisler and Krystin Rubin first worked together to start Mission Pie, which is a for-profit business that serves sustainable food including sweet and savory pie. 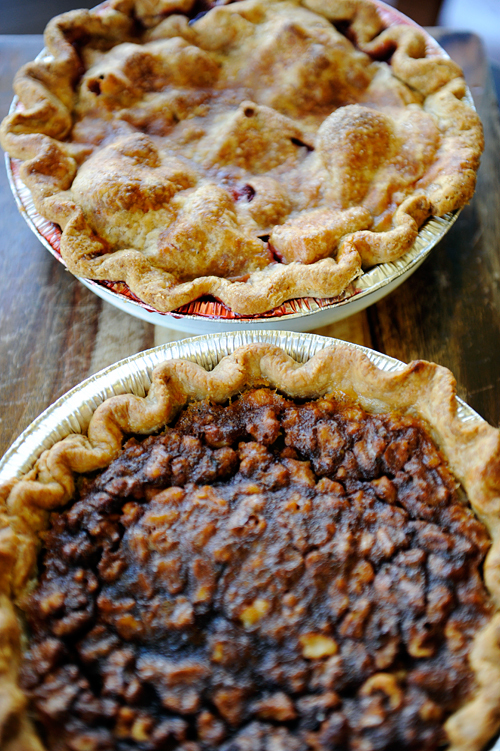 The two met a few months before Mission Pie opened in its original, smaller location. Rubin was finished with a farm apprenticeship and looking for work. Friends kept emailing Rubin the craigslist posting for a Mission Pie manager, so she decided "what the hell" and decided to apply. Heisler is also a co-founder of Pie Ranch in Pescadero, which is a non-profit sustainable farming parcel. Pie Ranch is one of the ingredient sources to Mission Pie. Heisler is an original Mission Pie partner, and Rubin eventually joined her. Rubin said the two, "live upstairs, on the top floor," of the building that houses Mission Pie. Here are Rubin & Heisler's picks for Bay Area food spots. Rubin: "I am a creature of habit. I think that comes from being a baker." Both describe Middle Eastern Old Jerusalem Restaurant as a regular eating spot, and Heisler said it’s "the OJ," and that "I feel so blessed 'Wow, this is on our block.'" She is a fan of the OJ's cucumber salad, which is not on the current menu. Rubin: "For a treat, I love Range. I love to sit at the bar. The bartenders are friendly and wonderful. I like to have a cocktail and a couple of dishes." Heisler: "For a nice romantic dinner with Krystin, it's hard to match the quality of friendly intimacy of the bar at Range. I've never sat anywhere but the bar. The food is consistently excellent, and it's a place that I change my clothes for." Rubin likes Zuni Café for "special occasion, Aunt and Uncle are visiting visits. Martinis and oysters, a Caesar salad." Heisler: "Ti Couz is one of my favorites for a few reasons. I love their savory crepes. I'll get a caramelized onion crepe, and big organic salad with cheese. It's really a wonderful place to share a salad. The aesthetic is in the most positive way a throwback… the hand cut wood bar. It feels to me like the place has a design that really touches my heart. It's so evident that they have a community of ownership and workership and are committed to a sort of functionally sustainable workplace model. It's compelling because it's so lasting. Krystin and I go there for lunch and dinner, and it's a favorite to go with my daughter," who is twenty-three. Heisler: "Sometimes I go out to the Latin American Club, early. If you can get that front window table…." Rubin said that the recently launched Mission Community Market, "has turned into the main place I get produce. It's nice to engage (there). We get stuff for (Mission Pie), twenty flats of berries." Heisler: "It's interesting to see it evolve, and feels important to go there. The producers are (of) super high quality." Both also go to Rainbow Grocery regularly, and Heisler said she is "a Rainbow loyalist all the way back to 16th Street." Nearby Semirami's is a favorite of both, "for olives and things like that," said Rubin. You may spot Rubin reading the papers in front of Valencia Whole Foods. "It's a nice sunny spot. I read the Sunday Times, and get a kombucha." Heisler: "I love going to the Alemany Market and rarely have the opportunity anymore. We both work on Saturday." The two did get to recently go the weekend after Thanksgiving, when Mission Pie was briefly closed. Heisler: "We have friends who started a farm: Dinner Bell Farm." Mission Pie is a pick up spot for their chickens. Heisler described the Dinner Bell Farm birds as "so wonderful. The birds are delicious. There is a Hungarian chicken that has dense tasting meat, with a thin skin. It makes me think of my heritage." According to their Twitter feed, there's a chance of spotting the Mission Pie crew at this Friday's La Cocina Gift Fair, held at the nearby Mission Cultural Community Center for Latino Arts. Or go straight to the source, and see Heisler and Rubin in action at Mission Pie.